There only one directory `font-awesome-4.7.0` under `Web` rest are files with KB sized. I don't understand why the `Web` directory grab `28GB`. There `HandicraftStore` contains a `.git` folder. Just a student successfully edited my question. But, my question is why it results in an error while I try to edit. Is this error related to reputation? If it is related to reputation, then the error message should be something about reputation like "you have not enough reputation". I attempted to reproduce the issue. In fact, I went ahead and submitted an edit. It did not trigger the warning for me. It did not even warn me when I did not have blank lines separating the images. As it stands, this question is status-norepro. At least for me. I could imagine that this is related to some reputation-related check (I have editing privileges). Not the answer you're looking for? Browse other questions tagged bug edits error-message . 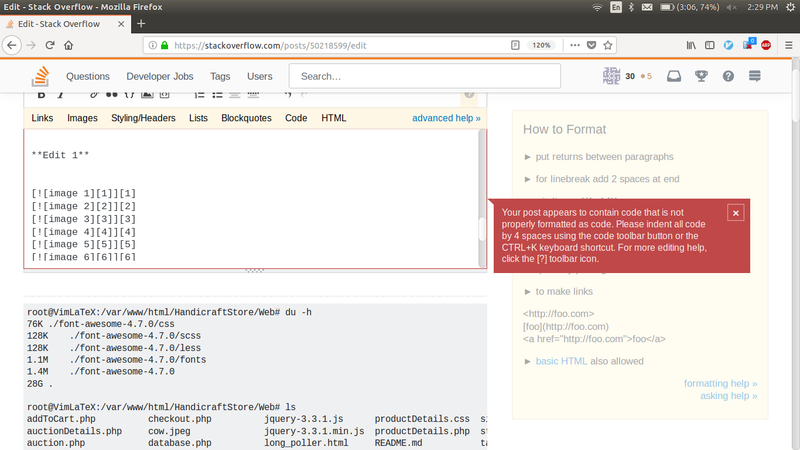 Why is my answer triggering a “not properly formatted as code” rejection?